Please join us this Tuesday, May 22nd, for an engaging conversation and book discussion featuring University of Virginia Darden School of Business Professor Jeanne Liedtka. 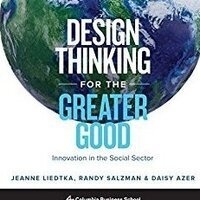 Professor Liedtka will discuss design thinking and stories from her new book, Design Thinking for the Greater Good: Innovation in the Social Sector. The book explores how design thinking influences innovation outcomes in a variety of social sector industries including health care, education and transportation. Design Thinking for the Greater Good demonstrates how design thinking can help reframe problems and create innovative solutions. Presented by Parsons School of Design, School of Design Strategies.